All, while cleaning the make space these items these items were found to be removed. If any of this stuff belongs to you and you want it please remove it from the make space. We are trying to clear space as we have too much stuff. If you believe this should stay and you are currently using it for a project please post here within. If these items are not removed within one week they will be thrown out or donated. 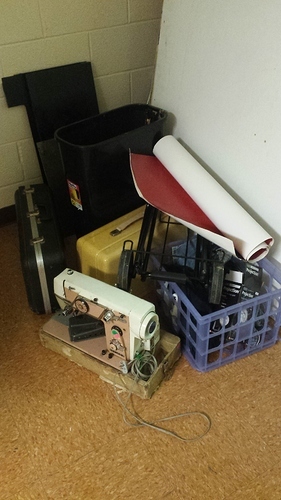 Unless we have a better one, that sewing machine should stay. I consider that a maker tool. Jonathan took this heavier duty one back home.